Kisame Hoshigaki is a missing-nin from Kirigakure and is partnered with Itachi Uchiha. He gets along considerably better with Itachi than most Akatsuki members do with their own partners, immediately doing as Itachi asks of him and always looking out for Itachi's well-being. His former country, the Land of Water, now seeks him out for plotting to overthrow its government and being involved in numerous assassinations. When he was still loyal to Kirigakure, he was one of the Seven Swordsmen of the Mist, a group of ninja that wield particularly large weapons in battle. Kisame's weapon is called Samehada, a scale-covered sword that shaves off skin instead of cutting and is capable of absorbing untold amounts of chakra. Samehada only allows Kisame to wield it; if anyone else tries to pick it up, spikes protrude from its handle and it returns to Kisame's side. Like other characters who have trained to be one of the Seven Swordsmen, Kisame enjoys mutilating his opponents, as seen when he suggests cutting off Naruto Uzumaki's legs to make him easier to carry. Kisame has a distinctive shark-like appearance, complete with pale blue skin, small white eyes, gill-like facial structures, and sharp triangular teeth. 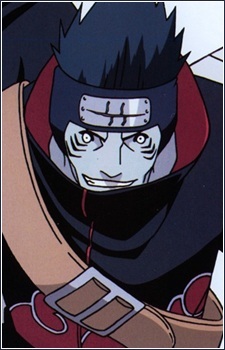 Even his name, Kisame, means "demon shark". His shark-like qualities carry over to the type of techniques he uses in battle, as he often shapes bodies of water into the forms of sharks that proceed to attack opponents. If there is no water source where he happens to be fighting, Kisame can use Water Release: Exploding Water Shockwave to create a lake's worth of water to be used for attacks. Kisame is also noted to have a particularly large reserve of chakra; even when he fights at 30% power in one instance his chakra supply is compared to that of a Nine-Tailed Demon Fox-enhanced Naruto Uzumaki.